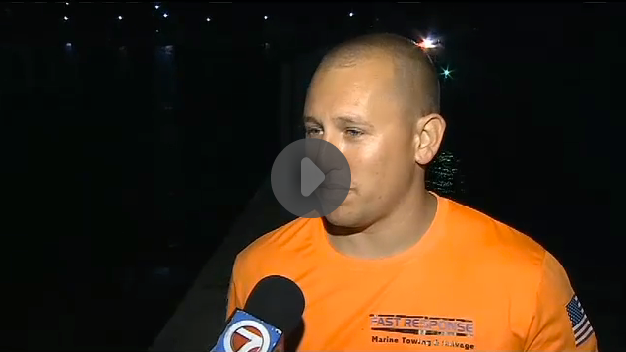 Fast Response Marine Towing and Salvage Captain Charles Hansen was on scene to aid in the rescue of two fishermen when their 26-foot boat started taking on water and capsized off Key Biscayne Sunday (March 1, 2015). After transferring the boaters to a Miami-Dade rescue vessel, Fast Response righted the capsized boat and began towing to shore, only to have it start taking on water a second time. “We didn’t realize it had the leak that it did, so after we de-watered it, it started taking on water a second time as we were making our way back to shore,” Hansen said. It turns out the men had remounted the engine and failed to patch the previous mounting holes. While attempting to bail water from the boat, a wave swamped them. 1. Don’t forget to patch any holes that could dip below the waterline! 2. At the first sign of trouble, put on your life vests. 3. Call for help immediately on VHF Channel 16 or dial 911 on your cell phone, BEFORE trying to fix the problem yourself. You might not get another chance to call for help!